Thread: New year, New Wheels? could run cardboard disks and it'd still look good. that color is amazing i can't wait to see it in person. 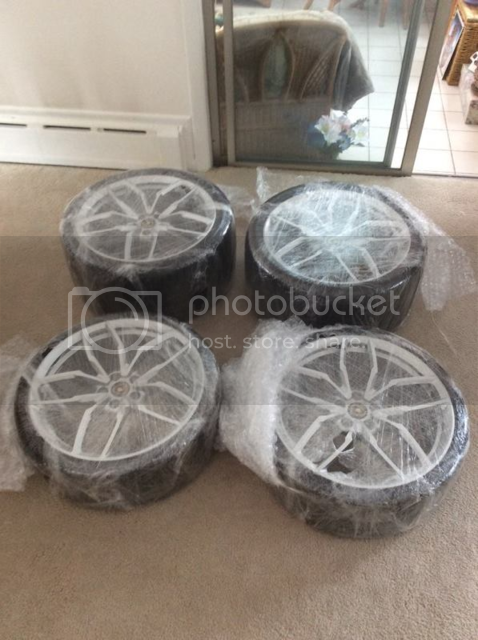 $11,000 for stock wheels? wut. I know the HRE are expensive but even they can't be that bad, can they? I'm sure a good part of it is Lambo tax, but even if you opt for these wheels when ordering it's a $6,500 option. I like them, and I'm sure they are high quality, but theyes are still factory wheels which means a lot of lambos are going to have them. The HRE would be more unique and it sounds like it's going to be similar in cost? If the stock were much cheaper than the HRE I might have a different opinion and I do like them too. I think more R8's had the P101's than stock wheels? Dave, the guy that had the blue R8, will be putting his HRE's on his new 580-2 Spyder and other than his how many Huracans will I even see? I got a good deal on these so even if I decide to go HRE at some point I could sell them and get most of my money back. Where are you parking that a bright blue Huracan could be lost in the crowd unless it has custom wheels? Didn't realize scott already bought the other ones. Hope price was good. They do look great. I did get a good deal, paid $5,200 and free shipping. The HRE's in 20" would have been about $11k and then another few hundred for TPMS and mounting/balancing. With getting the set I got on it will be an easy swap since they are coming all set to just put on car. This way I can sell my stocks complete with tires, should be able to get around $3k for them. New wheels went on, I'm sure some will like old better but for my conservative taste I prefer these. they look really good. i love the silver on the blue. Thanks, got windows tinted today.